I’m dumbfounded and stare at him blankly behind my goggles. It hasn’t snowed in a week. There’s no fresh snow. But everyone else responds with an excited, affirmative answer. They continue talking as though they were just in three feet of blower pow. The guy says the runs are only good for three laps before they’re totally tracked out. The others agree with him in a non-committed way, secretly hoping there are a few more trackless laps in their future. He’s obviously a local and serious about getting the goods. But what goods? Then as we crest the ridge of Sunrise, I see the light: the yellow glow of two grooming machines chugging up the hill noisily, clearing the day’s accumulated granular moguls, like Zambonis, turning bumps into buttery smooth corduroy. They’re talking about groomers. They’re talking about getting first tracks on groomers. These people are giddy and ecstatic like it’s a powder day. Then the guy starts bragging that he’s here every day following the machines from one run to the next getting fresh tracks for a good hour or so before heading home. Naturally, when we get off the lift I follow the guy. We get to the top of Sunrise just as the patrollers drop the rope and a handful of people hoot and holler while dropping in. And I’m one of them. Groomers are a damn good time. There are no bumps to surprise you in the flat light of an overcast winter day, meaning you can confidently transition from one turn to the next, gathering speed the entire time. 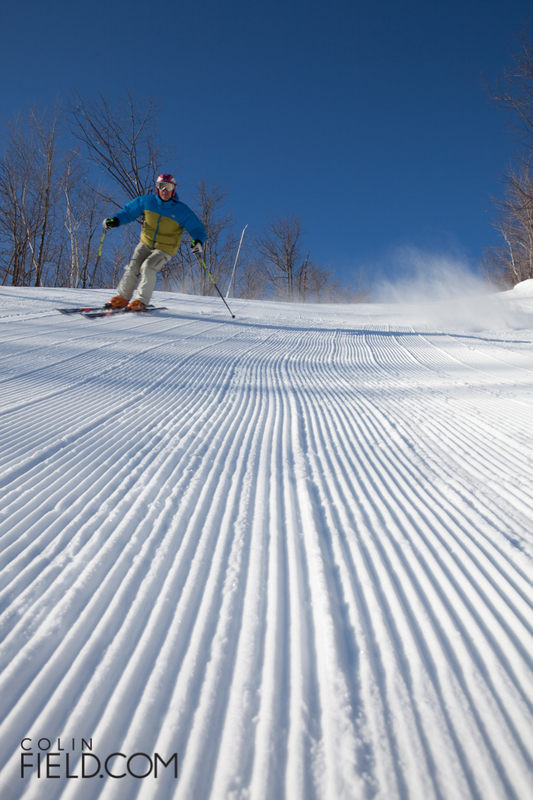 Hell, if ever a run was begging to be tucked and straight-lined it’s a fresh groomer. It doesn’t make for long runs, but it makes for fun ones. I cringe, realizing he’s giving away his secrets. But I applaud him in this: he’s found his way of beating the system. And he’s willing to share. They say it takes all kinds; whether you snowboard, ski, nordic ski, snowshoe or whatever, everyone has their own interpretation of fresh tracks. The challenge is getting out there and finding them.